When family's start to come apart. It is very wise that you eat something that is tart. Maybe a nice sweet - or even something with heat - because it stops you from wanting too fart. Well, that is what these chaps told me! Writer: Peter Tomasi; Artist: Patrick Gleeson; and Publisher: DC Comics in March 2012. 'The Real Me' is a story comprising a tale of times past, a tale of times present, and a question that is very-very personable too. IN THE PAST: Now I am afraid to say that a young Bruce Wayne did not really understand what he was getting himself into, when he asked Henri Ducard to teach him his craft. You see, Bruce thought that he was going to learn how to track down a suspect from Henri and his son, Morgan. But instead, he learnt that these two men where hired killers who had their very own brand of murderous justice. Results? Bloody to say the least. IN THE PRESENT: Morgan was just on top of the world whist he had Damien by his side. Damien was willing to kill, he was willing to subdue a target, and he hated his Dad, Bruce, too. Morgan was wrong - Damien was playing him for a fool all along. THE QUESTION: Once Damien has revealed his true colors and signaled his Dad, Batman, where his location is, do you honestly think that Morgan will allow him to live? Although this conversation does not really have any story relevance where this issue is concerned, I liked the quick banter between Batman and Gordon during the aftermath of the embassy debacle. GORDON: What the Hell went down here? BATMAN: An Ambassador was taken, I'm on it. But I need two hours. Very eighties in tone, don't you think? 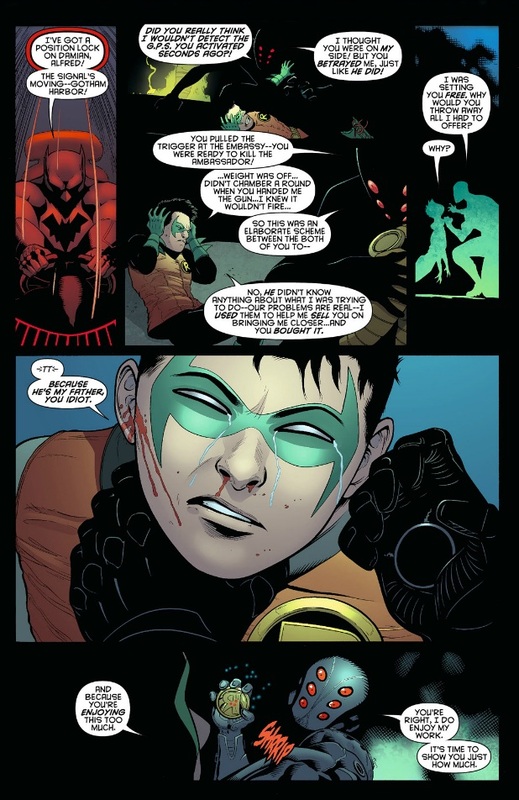 For me, personally, I liked the unveil at the end of this issue, where the little brat, Damien, turns the tables on Morgan, and explains to him that he had suckered him into his scheme all this time. What a conniving little sod. Because I am very familiar with the Ducard back-story from its previous incarnation, I found it very difficult to take in that Bruce did not realize Henri he was an assassin. Please note, a similar thing did transpire within its prior telling (Sam Hamm's 'Blind Justice'). It's just that last time within the confines of the particular story it was trying to tell, it did come across in a more natural and free flowing way. STORY: Yes - as a story goes - this one wasn't that bad really. But the only thing new with this book is how we are starting to perceive Damien. Because is he as bad as he wants people to believe? Or is a lot of what he says and does all an act? Nice new dilemma. ART: Listen, I am not sure if it's just me, but I found Patrick Gleeson's artwork much more cleanly executed in this issue than his previous wares. Maybe this is because he is growing on me as an artist. Or maybe he is starting to gel on this title in a much more fresher way. MORGAN: Now Morgan has that face and that demeanour which screams envy, right? Moreover, for an actor to be able to pull this off, he has to have had some practice in working opposite an imposing figure. Omar Epps from 'House M.D.' anyone? HENRI: To me, Henri will always be a French assassin who likes a good smoke as much as he likes a good kill. 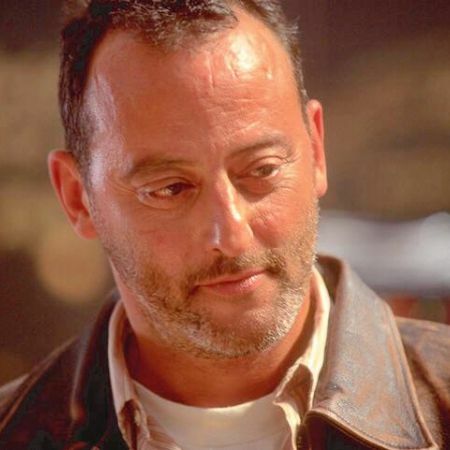 So who better to portray this than Jean Reno of 'Ronin' fame? If You Thought That It Was Safe To Corrupt The Young Whilst Dipping A Diplomat Into A Vat Of Acid - You Never Met Damien. Mainly because of the sentiment conveyed in the latter half of this issue, I feel that Wheatus's pop-teen anthem, 'Teenage Dirtbag ', has a similar vibe about it too. But wait a minute? Damien isn't a teenager yet, is he? This was a very nice issue all in all. It had a bit of pathos, a bit of originality, and it presented a new take on a character that we all thought we knew - Damien, the little sh*t.
Still, I would like to see what happens to this book once 'Batman Incorporated' kicks in gear. Plus, how this title will fit into the alluring Bat-universe amidst the up and coming 'crossover event'.